CallTrackingMetrics, a leading provider of call tracking software, launched CTM University–a set of new training seminars designed to thoroughly educate customers on core features and functionality of the software. Taught by experts at CallTrackingMetrics, the seminar topics range from call routing to advanced analytics and reporting. “We wanted a way to connect with our customers and help them make the most out of their technology investment in call tracking. This is a highly cost-effective way to master the features and functionality of call tracking, train new team members, and get your account up and running quickly.”, said Laure Fisher, Co-Founder and COO of CallTrackingMetrics. Covering Number Configuration, Routing, Reporting, User Management and Agency Settings, this class is perfect for existing customers who want to make sure they have a solid understanding of all the core features and functionality, and for new customers who are looking to get a fast start. In addition to covering all the advanced reporting capabilities of CallTrackingMetrics, attendees will learn how to sync and analyze meaningful call data from CallTrackingMetrics into Google Analytics and AdWords as we demonstrate relevant examples and best practice strategies. 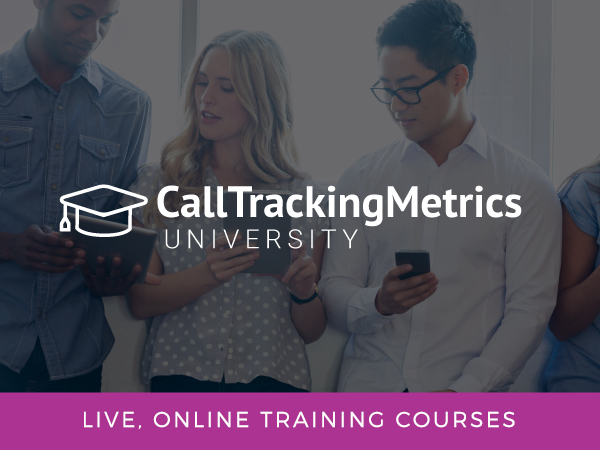 To learn more about CallTrackingMetrics’s full training and consulting offerings, visit CallTrackingMetrics.com or call 800-577-1872.